If Gorilla's Death Moves You, Consider Other Animals' Plights After the shooting death of Harambe the gorilla at the Cincinnati Zoo, NPR's Scott Simon reflects on the living conditions and deaths of other animals, such as the ones we raise for food. Zoo visitors look at protesters and mourners from a walk bridge during a vigil for the gorilla Harambe outside the Cincinnati Zoo & Botanical Garden. The shooting death of Harambe, the 17-year-old western lowland gorilla, after a 3-year-old boy fell into his cage at the Cincinnati Zoo, is a tragedy in all ways. Harambe delighted zoogoers, and may have meant the boy no harm. The little boy's parents say they are grateful their son survived and is doing well. But many people on social media platforms have attacked the mother as neglectful. Wayne Pacelle, president of the Humane Society, said on his blog that the debate over how Harambe died reminds him of old dorm room discussions where people would pose imaginary questions that weighed the life of an animal against a human being's. But if some of the people who snarl at the boy's parents on social media want to do something more for animals, they may need to look no further than their own dinner. We have heard a lot in recent years about the 8.5 billion chickens that are slaughtered for food in the United States every year. The ones that live on factory farms are kept in cages about as large as a sheet of copy paper. Their feet never touch the ground. They never see the sun or sky. They never play or mate. Their beaks are often snipped or burned off to keep them from pecking each other to death in those cramped, congested cages. Harambe's death might also remind us how more than 100 million pigs are raised for food in the United States. The ASPCA points out that pigs, who are known to be as intelligent as dogs, are one of the few animals Americans both keep as pets and raise for food. Most pigs are kept in windowless sheds on factory farms, in cages so small they cannot turn around; so they will grow fat. They live in their own manure, and the air is so heavy with ammonia that many pigs develop lesions on their lungs. Female breeding pigs are put into what are called gestation crates, where they are artificially inseminated. They give birth, then are inseminated time and time again; and when they can longer get pregnant, they're slaughtered. We could go on. But it is not necessary to become a vegetarian to change what we eat to consume fewer animals, which is probably healthier anyway. 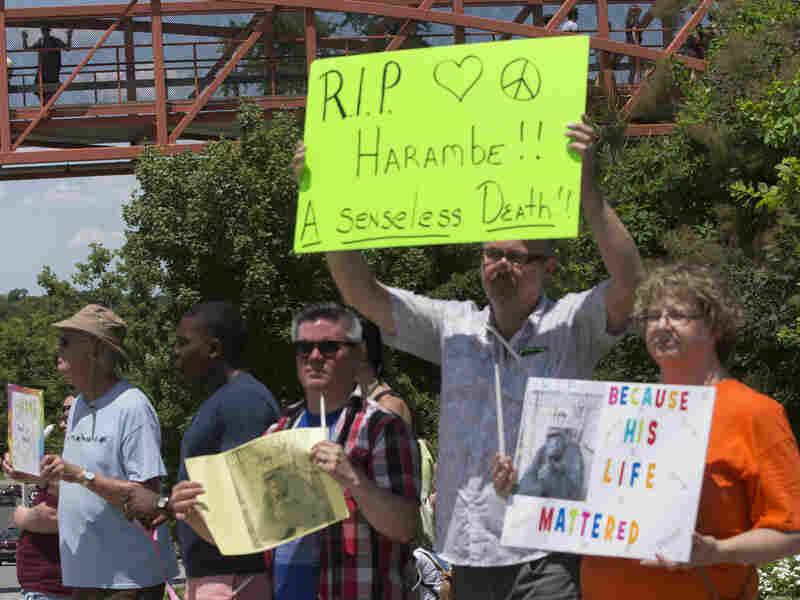 What happened to Harambe was a catastrophe, but one so rare as to be almost unprecedented. The treatment of so many millions of animals raised for food can be just business as usual.